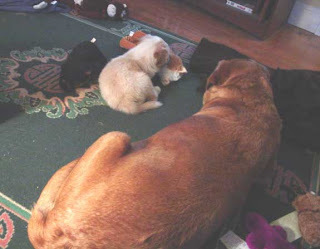 Today we have a guest post from the Dog Daddy at our house. He has his own method of dog training and shares it below. 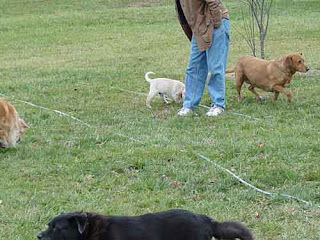 We have used this method of dog training for many years and have found it to be easy and very successful. There are a few things that you will need that are very important. First you need an adult well trained dog. Preferably one that has lived in your household for most of its life. Second you will need lots of dog toys. The first dog toy we can remember was a stuffed monkey. So ever since we have referred to dog toys as monkeys. I am talking about all manner of stuffed, soft or hard dog toys. The third step is to go to an animal shelter or a responsible dog breeder and adopt a puppy. So now you will have two dogs. Having had as many as 4 dogs in our family at once I believe the more the merrier. But you don’t need 4, you only need the two prior mentioned dogs. An adult and a puppy. The next step is essential, but easy. You take the puppy home and love it while not neglecting your adult dog. Your adult dog will take it from there. 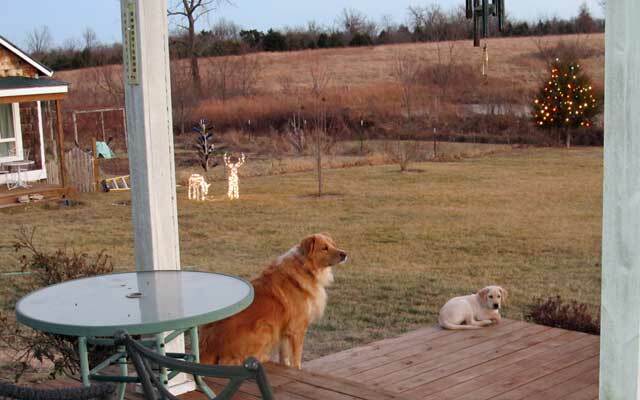 Puppies are a lot like children, they look up to their elders and try to act like them. 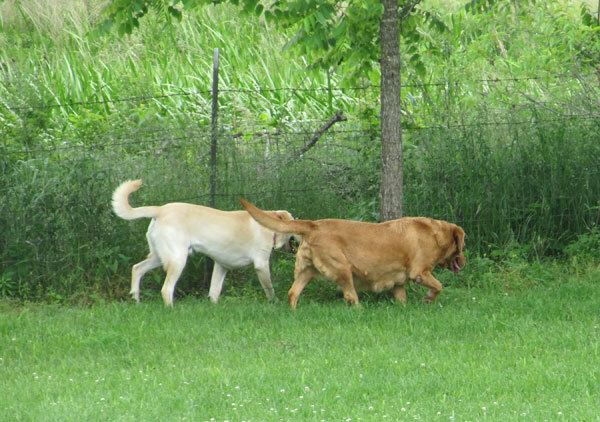 When your older dog goes out to do its business be sure to take your puppy along and it will much more quickly learn to go outside to do its business. 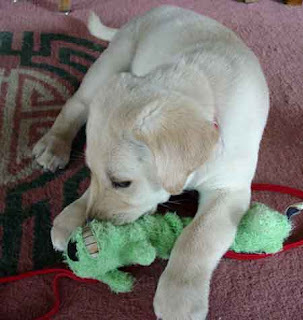 If your adult dog chews only on monkeys then your puppy will learn to only chew on monkeys. 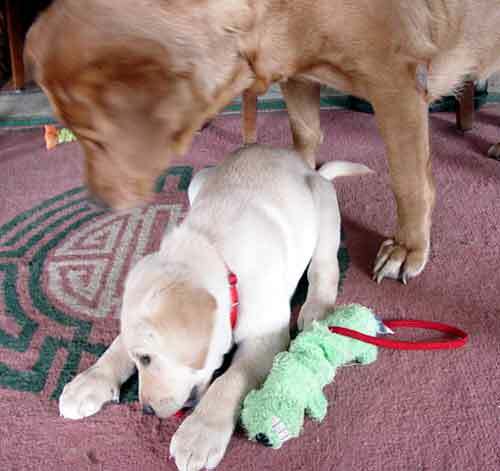 If your adult dog thinks one of its jobs is to protect the family your puppy will learn to protect you. The list goes on and on. By now you can see why it is essential that the adult dog is well trained. If it is not your puppy will also pick up on any bad habits. Those of you who read this blog will remember Tucker; he was head of security at For Love Of A Dog and one of the original talking dogs. 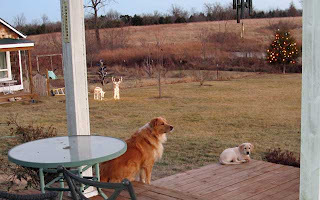 We have always had a very large back yard and Tucker was great at patrolling the perimeter. 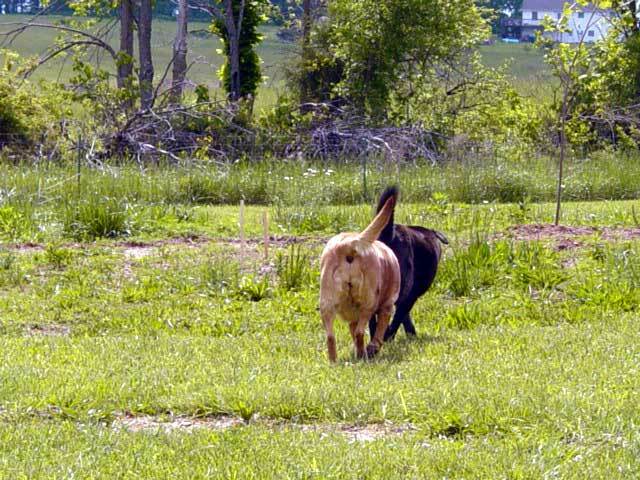 Every time he went out he would run the fence. Since then, all our dogs have patrolled the fence because Tucker taught them to do it. 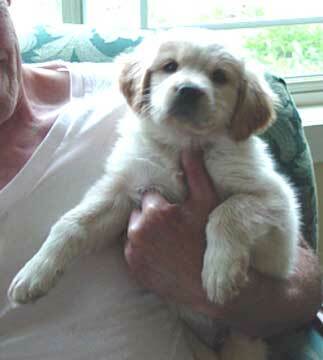 Lucy, former design diva at For Love Of A Dog, was Sue's constant companion. Now that Lucy is waiting at the rainbow bridge, Jeffie has taken over that task and is almost always at Sues side because Lucy taught him to do it. Of course this is not all you need to do. 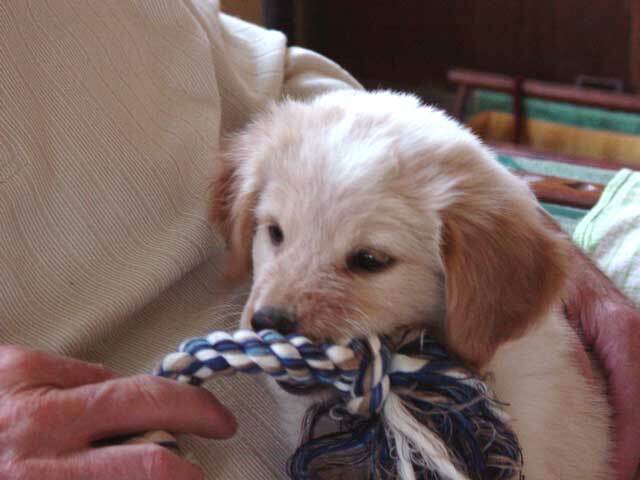 You will still need to properly socialize your puppy by taking it for walks, getting the puppy out in the world and around a lot of different people. 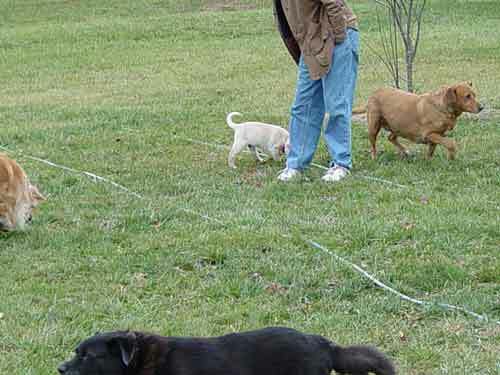 It is good to do some of this without the adult dog so the puppy will learn some independence since it will likely have to live part of its life without its tutor. By that time your puppy will be a grown adult dog who will be ready to teach your next puppy the ropes of life in your household. Hey Jeffie, Hey Rudy, Jet here. Hi Mr. Dog Daddy. Oh, Mr. Dog Daddy, you are wise and dispense manly man advice I can understand. We've never shared Casa Jet with a young put/kitten. Mom always adopts adults, however, your principles are logical and simple... I like that. That makes a lot of sense! Since Rita is still closer to puppyhood than adulthood, maybe I should find a well-trained senior to come home and show her how to be more mellow! 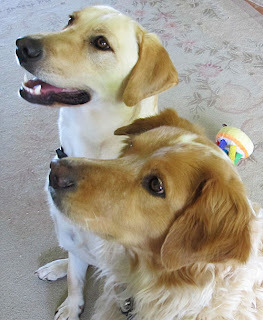 That's a great post and I've seen this training method in action myself...My Cecil learned everything she ever needed to know by watching my Murphy...including retrieving ducks to hand, which was quite a trick for a German Shepherd Dog to learn!